In recent years, Multiple Unit trains, 'Sprinters', 'Voyagers', 'Pendolinos', 'Turbostars' and others, have virtually replaced locomotive hauled trains. They offer greatly improved operational flexibility. SRPS has examples from earlier in the process of change - a 3-car 'Inter-City' Diesel Multiple Unit from 1959, with an additional 'Inter-City' Buffet trailer car from 1956, and a 3-car Glasgow Electric Multiple Unit, a type universally known as a Blue Train. The former was designed and built at Swindon Works for use on the lines from Glasgow to Edinburgh and to Ayr/Stranraer, and units were generally known as "Swindons". The Blue Train was built at Linwood by Pressed Steel. 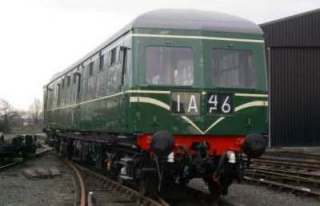 Click below for details of our Diesel and Electric Multiple Units.